Adis says: Pretty, isn't it? And kind of sweet too. 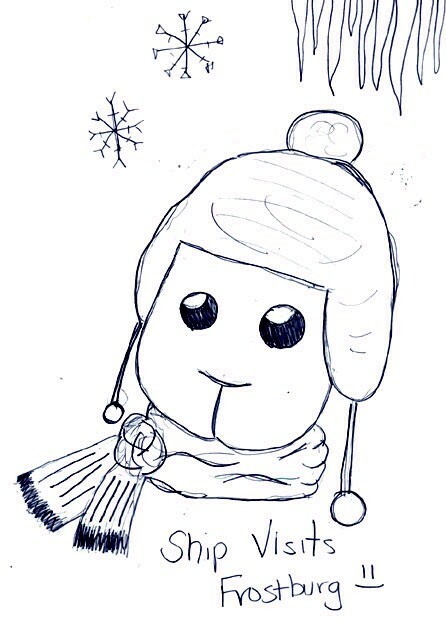 No Adrianism today, instead, a History lesson: this was drawn by my freind Andrea from Frostburg, MD. It's particularly important given that Andrea had a big role in the creation of CYS. Andrea is a comic strip aficionado, but she isn't concerned with the artwork, or the storytelling, or any of that artsy nonesense, but cares first and foremost for her gut instinct. So, I tried to entertain her with previous efforts, to no avail. My concepts were a bit too complex and difficult, so for my new webcomic, I decided to try to do something simple, cute, and witty, something a person like her would like. And she does, so we can say the strip is a success! Every now and then, I'll mention the real life influences of CYS, from its origins like today, to the real life people who help me keep going everyday.